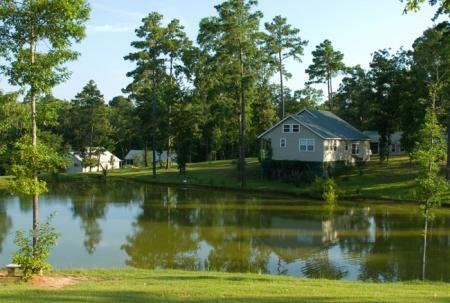 Wildwood Resort has Lodges and Cabins on Toledo Bend waterfront and overlooking stocked ponds on 80 acres. RV Park sites are also available. BBQ pits, Picnic Tables, Cabin porches with rocking chairs, Pet Friendly. Wildwood Resort can accommodate over 200 guests. Guests are welcome to stay by the night, the week or by the month – We are flexible and will work with you to suit your needs. *Seasonal Discounts are often available. RV Pads- Monthly rate $260 plus electric, Nightly rate $25. Security lighting and security gate. Toledo Bend Lake is the finest Bass Fishing Lake in this country. 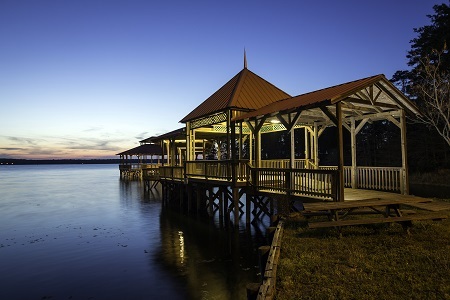 Wildwood provides a 300’ Fishing Pier – Lighted for Night Fishing – Covered for your protection and baited for your fishing success. Wildwood includes a modern boat launch, 1200’ Waterfront, with floating walk, fish cleaning station, a place where your boat is safe and secure, out of harm’s way! Wildwood offers six large stocked ponds for your fishing pleasure. As these ponds are on private property – you do not need a fishing license! Fishing Guides and Golfing dates can be arranged. Our network of various size cabins and conference centers are a perfect place for family reunions. You can have your own cabin for privacy, but be close to one of many meeting cabins or centers. We also have RV sites available. You can cook or we’ll cater making your family event really special. We can design your event to your wishes. Wildwood is primarily a Family Friendly Facility. What would a resort be without a swimming pool? Wildwood Resort has 3 swimming pools and 1 Spa Pool! Different depths provide safe enjoyment for our kids – of all ages! Our adjoining decks keep mom happy as she basks in the sunshine and watches the kiddies. There is a playground adjoining our main pools! All Wildwood guests are invited to shop in our gift shop at their convenience. Our shop is filled with beautiful gifts for all ages. Our souvenirs will remind you of the good times at Wildwood. We also have refreshments for all. Our corporate customers find Wildwood Resort a great place for their function. Two large centers (Conference Center & Pavilion) provide meetings and dining in adjacent buildings. These venues are particularly nice because of their beautiful views of the lake / ponds with fountains and nature. Each facility easily accommodates large groups comfortably. They are designed to enjoy the beautiful views and solitude of Wildwood. A great place to communicate and focus without distraction. After the work is done – we can arrange Golf – Fishing with Guides –– - horseback riding - group shopping afternoon in historic Natchitoches with Boat Tour on Cane River – group cooking lesson at The Landing Restaurant - or just plain relaxing. When supper arrives, that’s when we shine! Wildwood is at its best with Outdoor functions. Numerous decks and patios provide opportunities for any event our guests want. Bon Fires - BBQs – Fish Fry’s – Seafood Boils – Picnics - Live music – as close as a phone call! Best of All – check our prices – we’ll keep the Boss happy! Your event is only limited by your imagination. Wildwood has served as an outdoor Wedding Destination for 20 years. We host more weddings than any other facility in north Louisiana. We have earned this honor and prove ourselves with each wedding. We also offer Bridesmaid / Bachelor parties and dinners. We host Rehearsal Suppers and Bridesmaid’s luncheons. We have a private Bridal Suite for the wedding party to dress in and 4 other private suites for the wedding party & family’s convenience. Our Weddings & Receptions are amazing and very successful. We have a professional in house Wedding Planner & Consultant to customize the wedding of the bride’s dreams. Some guests have said they are almost ready to get married again – just to enjoy a Wildwood Wedding! We would like to offer our catering to complete and maximize your function. Our sister company “The Landing Restaurant” in Natchitoches is an icon in food service. They are well equipped with staff, equipment, and experience to insure a fine meal of your selection. We’ve done catering for many years from 2 guests to 1200. Wildwood is a complete resort – Check our web site for further information – We’d love to welcome your group!